Shutterbugs are babied in Dubai’s gigantic camera market. Considered to be one of the most diverse shopping market, Dubai equally coddles the needs of professional photographers and enthusiast snappers. And even it pampers those who just want to buy a camera to make their memories immortal. The entire electronics market of Dubai is enormous with hundreds of shopping options. Likewise to buy a professional or a cool-pics subjective camera, this is not at all lesser than a utopia to shop. Dubai is a full-fledged nirvana for buying amateur and professional cameras. The city offers you hundreds of exclusive brands and colossal variety of photographic products such as action & digital cameras, DSLR’s, camcorders, and all other types of audio and video accessories that your photographic hankerings call for. Every year, hundreds of people visit the city for shopping reasons; and when it comes to shopping, camera is one of the most sought after shopping item in Dubai, that visitors prefer to buy, due to duty-free prices of the products. Dubai has a large number of specialized camera shops as well massive electronics stores; which offer you a diverse product variety at affordable prices. 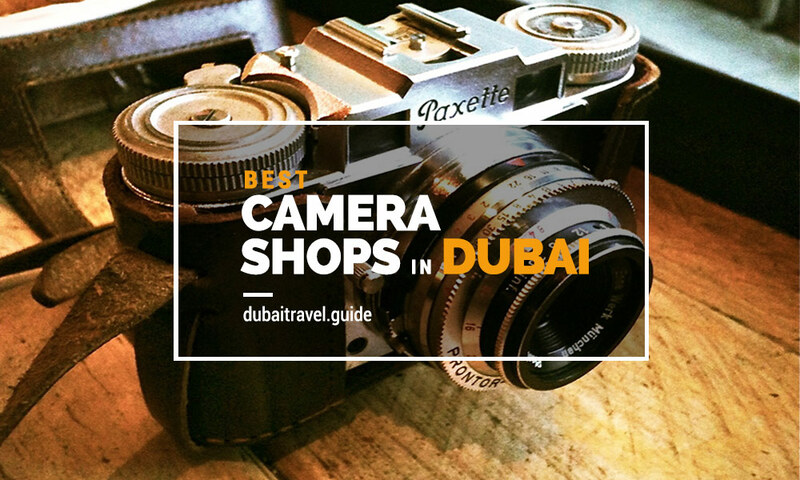 Tourists buy camera from these shops as it is one of the preferred souvenirs from Dubai. Here are some of the best specialized camera shops in Dubai. However, you may find a lot more on your own if you have sufficient time to explore. Yet, for your urgent needs these will certainly serve your requirement with their pronounced product assortment. Bhmstore is one of the finest place to buy your amateur or professional cameras in Dubai. The store specializes in all types of photographic equipment. Being an authorized dealer in UAE, the store offers a comprehensive array of exclusive brands. You may find here a wide collection of Camera, Lenses, Carry Case, Heads & Tripods, Pro Audio, Video Support, Studio & Lighting and other professional accessories. The store also offers remarkable online service for its global customers. Bhmstore can be located at Shop # 38, Al Jazeeri Building, Al Nakhal Road – Deira. This place loves photography and it actually portrays it. Dubai Cameras bring you the best product variety and quality of all the technology leaders such as Canon, Sony, Nikon, Fujifilm, Black magic and many more. This Dubai camera shop also has an experienced crew of developers, technicians and photographer who also offer you great assistance regarding product and its latest mechanisms. Moreover, if you look for saving some Dirhams, then you may look for their bundles and deals that can help you keep your wallet healthy and nice. Dubai Camera is located near Al Fahidi Street, Bur Dubai. Gulf Stores is one of the leading camera store for professional photographic equipment in Dubai. The store has an extensive variety of cameras, lenses, cards, lights, bags, tripods, filters, etc. It is a leader in multi-brand dealing and you may find here a large collection of DSLR, compact cameras and camcorders. The Gulf Stores also offers free cash on delivery services across Dubai, however you can also visit their store located in Cayan Business Center- Dubai. equipment and accessories. The store offers you to choose from a well-organized array of cameras, lenses, bags, stands, photography attires, rigs and supports, support electronics, lights, cards, DSLR microphones, pro-audio and video equipment, drones and much more. You can place your order online, or may visit their wonder world located at Riggat Al Buteen. Grand Store does not need any introduction. It is one of the largest camera shops in Dubai when it comes to consumer photography. Digital section of the Grand Store is encumbered with multi brand array of all types of photographic equipment and accessories. So if you are looking for something prodigiously photographic, head towards your nearest Grand store. Some of them can be traced at Down Town Dubai, Sheikh Khalifa Bin Zayed Road and in Mall of Emirates. These are some of the most sought after camera shops in Dubai. You can also explore stores to buy Electronics online in Dubai. To expand the list please comment below.